Using a fork, remove the blackcurrants from their strings. Place the blackcurrants in a pan with the sugar and simmer gently for 5 minutes until the berries are tender. Press the blackcurrants through a sieve into a bowl, pressing out as much juice as possible. Soak the gelatine in 4 tablespoons cold water for 5 minutes until softened. 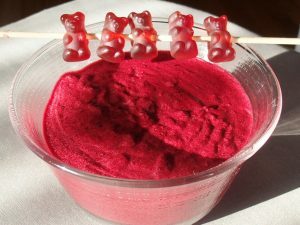 Remove the gelatine from the water and add to the warm blackcurrant puree, stir until dissolved. Allow to cool slightly. Whip the cream until it forms soft peaks. In a seperate bowl, whip the egg whites until stiff. Add the blackcurrants to the cream and stir well, then fold in the egg whites with a large metal spoon. Divide the mixture between 6 individual glasses and allow to cool until set. Top with a little whipped cream and a sprig of blackcurrant. Experiment further by adding 2-3 tablespoons blackcurrant liqueur.